Aloha State Sales has grown substantially over the last three years and in 2007 generated $5.1 million in revenue. 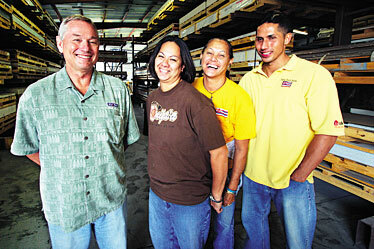 Standing in the company warehouse are family members, from left, Jim Sharp, chief executive; Kuulei McGee, who does the computer-assisted designs for countertops; Cindy Sharp, president and delivery truck driver; and Kaunaoa McGee-Sharp, who installs countertops. 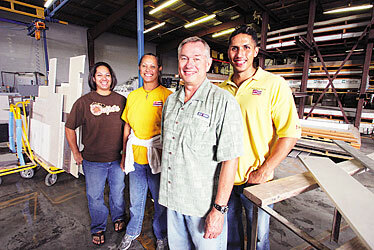 A family of athletes has used its competitive spirit to help grow Aloha State Sales, an interior supplier of solid-surface countertops, by turning around an unprofitable venture into a lucrative company in just three years. » Location: 2909 Ualena St.
Former triathletes Jim and Cindy Sharp took over the 50-year-old business in April 2005 and made significant changes to operations, including investing more than $1 million in new computers and equipment and relocating the company's warehouse from Mapunapuna to a smaller, but more usable site in the airport industrial area to cut overhead. The couple also dropped low-margin products and began manufacturing countertops using an in-house stone shop, which has resulted in nearly $1 million in sales last year. A thirst for competition runs in the family. Cindy's daughter, Kuulei McGee, who does the computer-assisted designs for countertops, was an All-America junior volleyball player at 14 and 16 years old, while their son, Kaunaoa McGee-Sharp, who installs countertops, was a star basketball player for the University of Hawaii and Assumption College in Worcester, Mass. Former triathletes Jim and Cindy Sharp parlayed their athletic drive into a highly-competitive business, turning an unprofitable venture into a lucrative building materials distributor in just three years. The couple, who run Aloha State Sales -- an interior supplier that specializes in solid-surface countertops -- in April 2005 took over the 50-year-old business, which had been in the red for years. The husband-and-wife team made significant changes, including investing more than $1 million in new computers and equipment and relocating their warehouse from Mapunapuna to a smaller, but more usable site in the airport industrial area, which cut overhead by $5,000 per month. "Business is a lot like athletics," said Jim, 62, who for 15 years competed in Tinman triathlons with Cindy, 60, who was chosen for Olympic volleyball tryouts twice in the 1960s. Jim had been the company's general manager in the mid-1990s until 2000 when the family moved to Southern California. "It's competition against yourself in setting up a budget and trying to beat it and competing with other businesses," Jim said. "When you're too old to compete, it's kind of an outlet." A thirst for competition runs in the family. Cindy's daughter, Kuulei McGee, 33, who does the computer-assisted designs for countertops, was an All-America junior volleyball player at 14 and 16 years old, while their son, Kaunaoa McGee-Sharp, 27, who installs countertops, was a star basketball player for the University of Hawaii and Assumption College in Worcester, Mass. But creating a family-run operation had its challenges, particularly for the children who had to learn how to run a business from the ground up. "For (Kaunaoa) and I, we've never known anything at all about it, so it was a whole new learning process," Kuulei said. "I don't get sleep at night if I think a job is wrong or a drawing is off." Part of the challenge is separating the family and business relationships, Jim said. "It takes time for the kids to look at their parents in a business relationship and develop the respect that they would have for an unrelated boss," he said. "There's less questioning of authority in a normal business environment." On the other hand, the most rewarding part of the family operation is being able to rely on the children, not just because it's their job, but because it's also their future and their family, Jim said. "It's something that goes beyond just being a job," he said. Jim, a certified public accountant and one-time chief financial officer for the Office of Hawaiian Affairs and president of Amfac Distribution Co. in the mid-1980s, brings experience and business acumen to the family operation, while Cindy, who drives the flat-bed truck and does the deliveries, "brought the aloha," he said. "It's a unique business with family who can be a real pain in the rear sometimes," he said. "But Cindy has such a big heart, she brings a lot of aloha. She softens me, and I try to sharpen her up a little bit." Among other changes the couple made to the business was eliminating low-margin ceiling tile, cabinet plywood and post-form countertops and replacing their top solid surface product with an acrylic product -- a huge risk that has proven successful. Overall sales have grown substantially over the past three years. In 2005, the company recorded sales of $3.1 million and in 2006 and 2007 sales totaled $4.1 million and $5.1 million, respectively. Aloha State Sales reached a milestone in late 2006 when it obtained a contractor's license to begin manufacturing Silestone -- a 97 percent quartz countertop material with a 75 percent market share. The company invested in a high-tech stone shop and hired and trained employees to fabricate the product, which recorded sales of about $100,000 in 2006 and nearly $1 million last year. Manufacturing will comprise about 50 percent of the business this year, up from 20 percent last year, Jim said. "It has allowed us to price stone countertops very similar to those on the West Coast because we use the same production methods they use there and it's capital intensive, not labor intensive," he said. "Most of the work is done by equipment, which is important in Hawaii because there's such a labor shortage." The business has grown from eight employees to 20 over the past three years, and at least five workers have been with the company for more than 30 years. "I think they're loyal because everybody's friends or related to someone or have been friends with somebody who has worked here," Kaunaoa said. The company expanded the stone shop with another $400,000 in equipment late last year and expects to double capacity this year. Aloha State Sales also began fabricating Silestone for Home Depot and plans to expand that business this year and double year-over-year sales in the stone shop, Jim said. The family is still making substantial changes to the longtime business, established in 1957 primarily as a Formica -- or tile -- distributor. By April, it will drop the lower-end Formica line and focus more on stone countertops, which is one of the faster-growing segments in the construction industry nationwide, Jim said. In addition, Jim hopes to eventually create a succession plan that would allow someone in the family to take over the business that he finds as exhilarating as an athletic competition. "It's a drive to excel, and in a business a lot of times, it's a little more complicated to do well than it is just to shoot a hoop or spike a volleyball because it is not as clear cut as to what you have to do," he said. "Every step along the way has got to be done right so it's a whole team that has to do it."